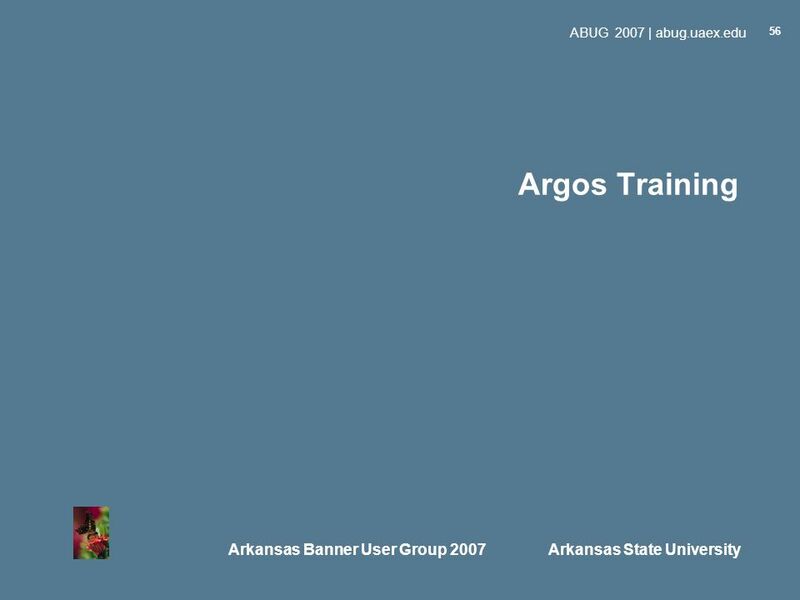 Arkansas Banner User Group 2007 Arkansas State University ABUG 2007 | abug.uaex.edu 1 Argos - Moving into the Community Presented by: Bruce Knox University. 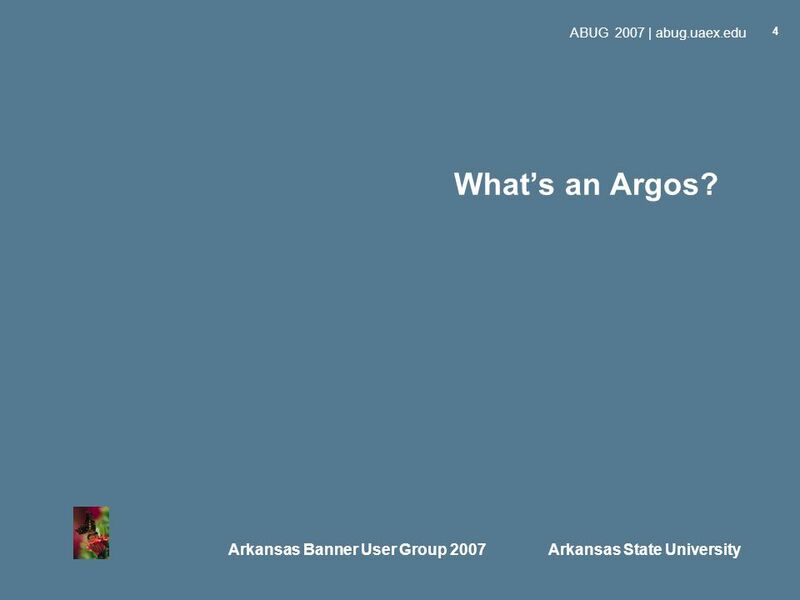 4 Arkansas Banner User Group 2007 Arkansas State University ABUG 2007 | abug.uaex.edu 4 Whats an Argos? 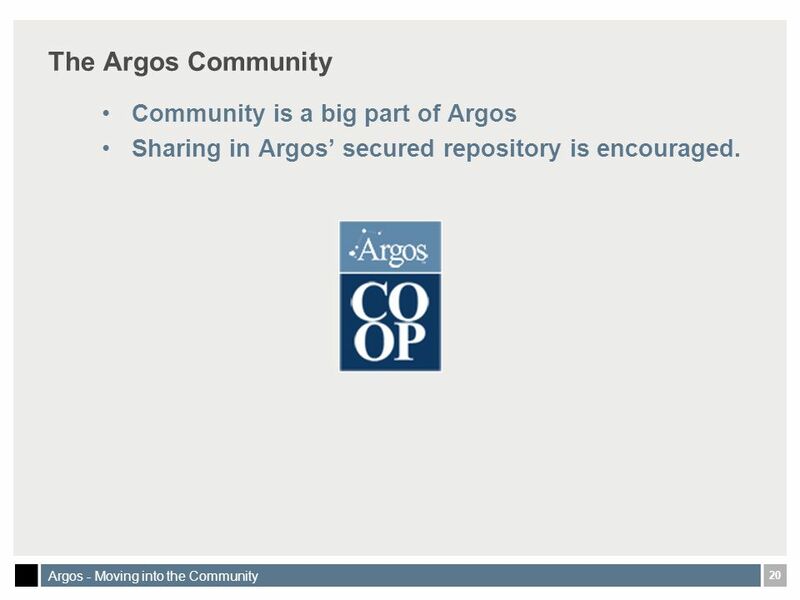 20 20 Argos - Moving into the Community The Argos Community Community is a big part of Argos Sharing in Argos secured repository is encouraged. 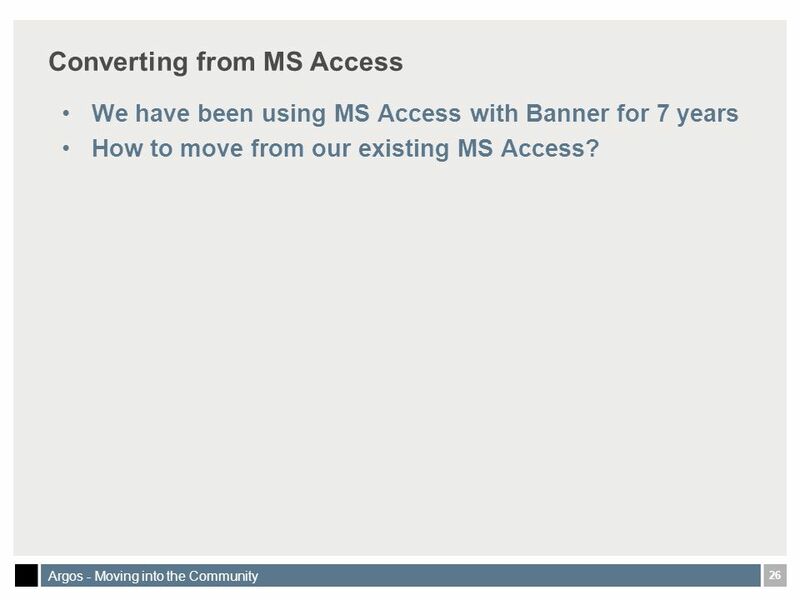 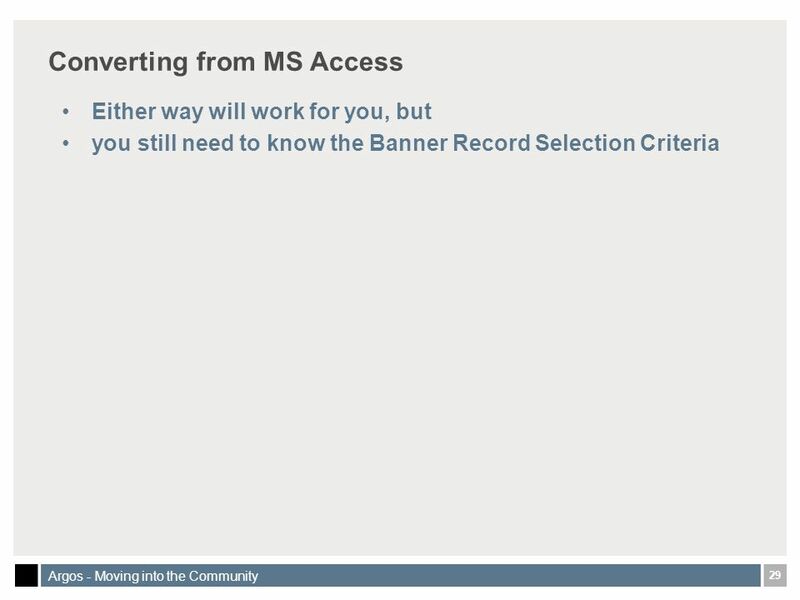 26 26 Argos - Moving into the Community Converting from MS Access We have been using MS Access with Banner for 7 years How to move from our existing MS Access? 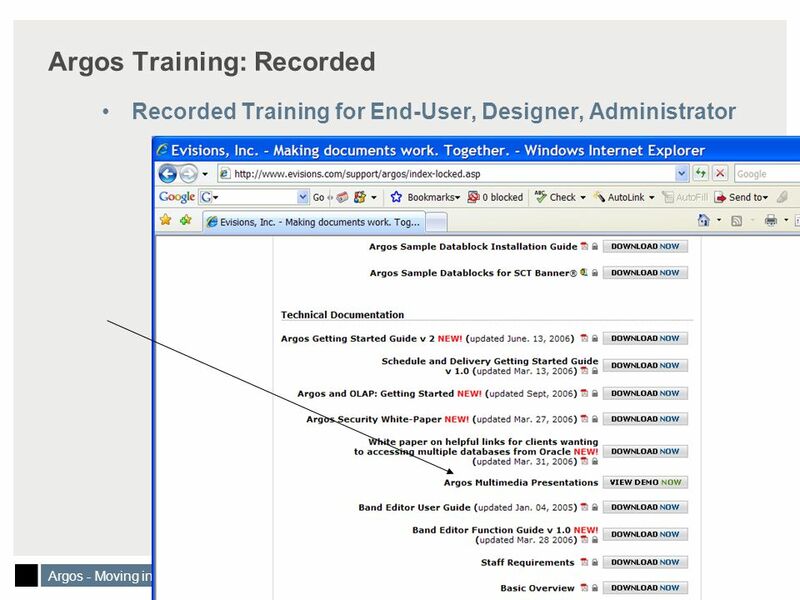 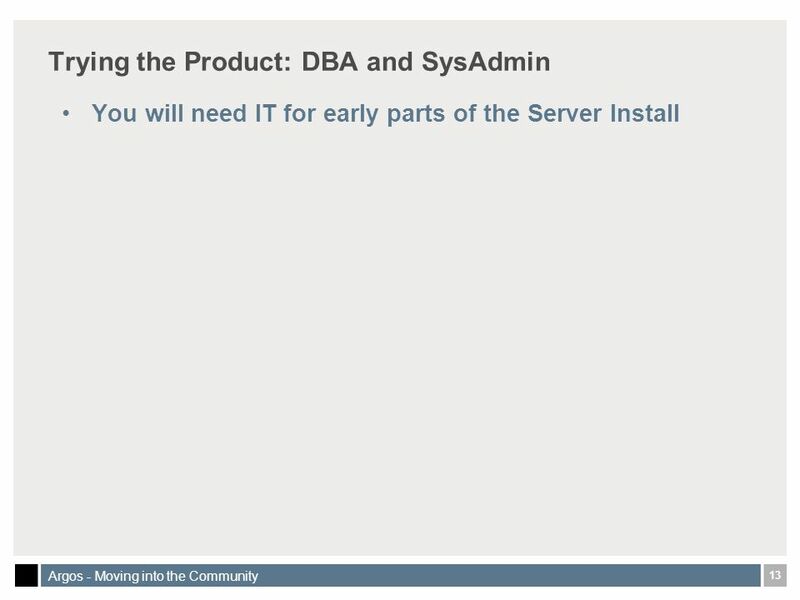 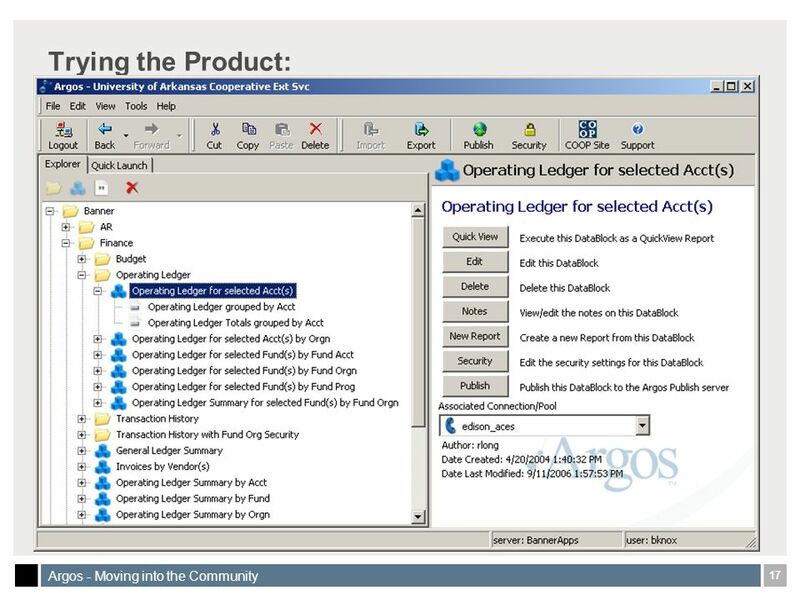 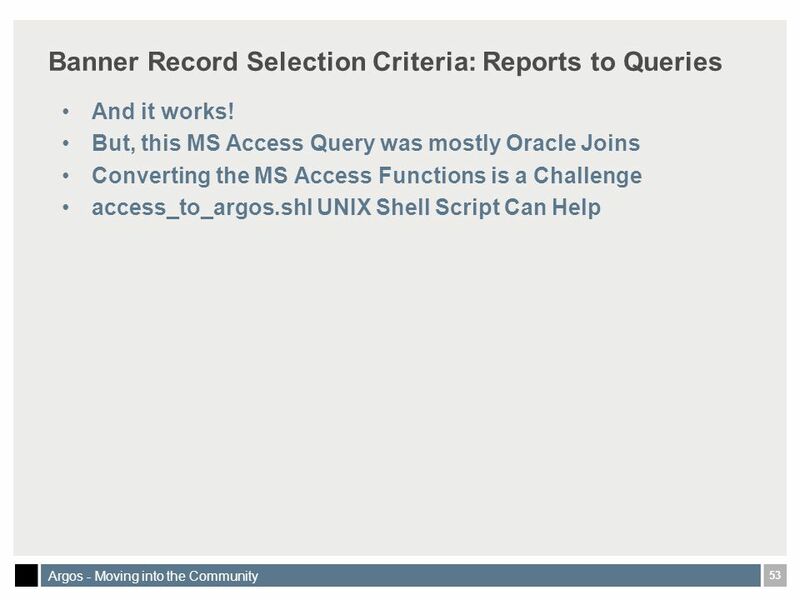 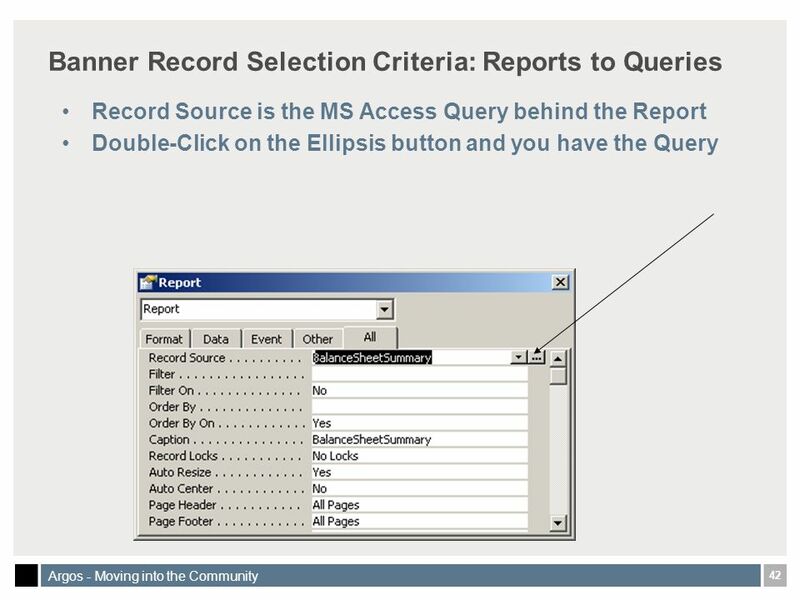 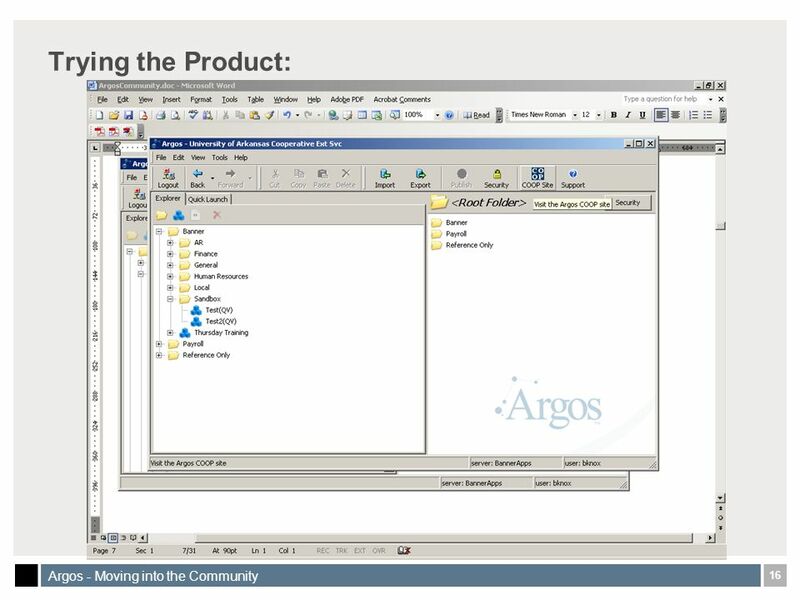 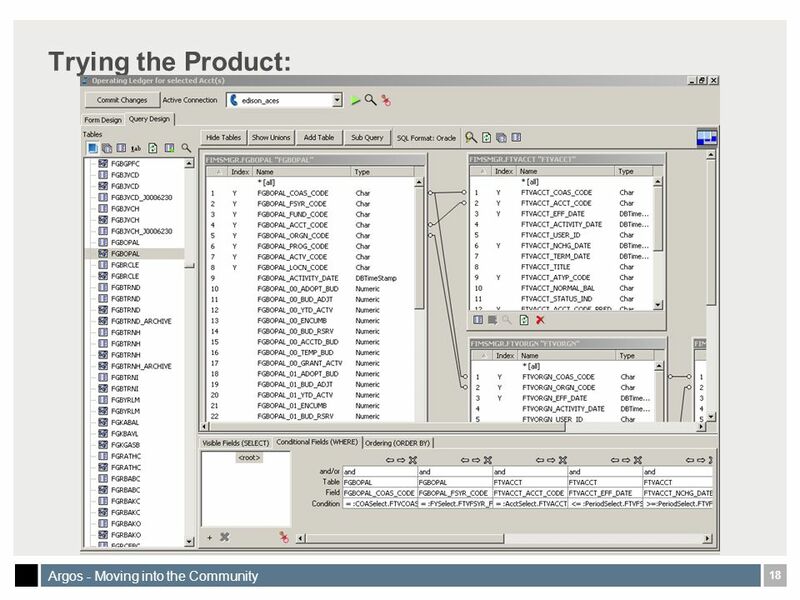 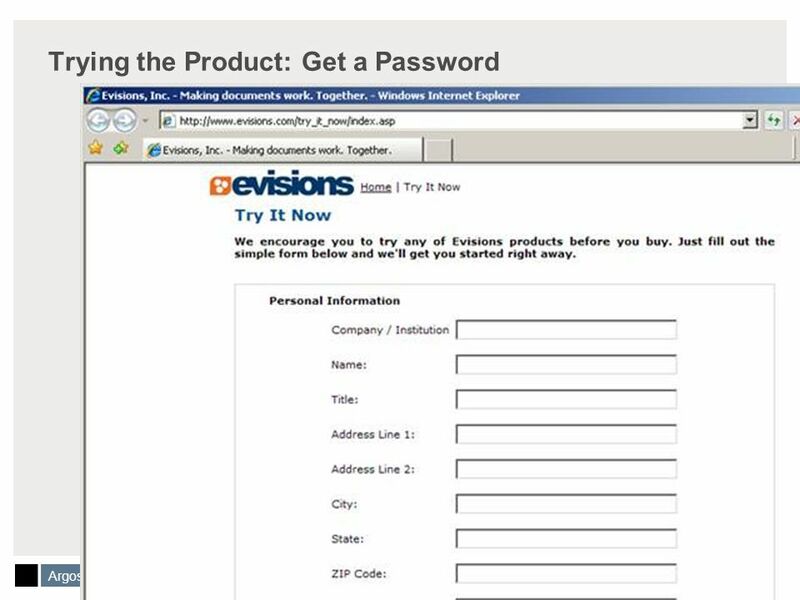 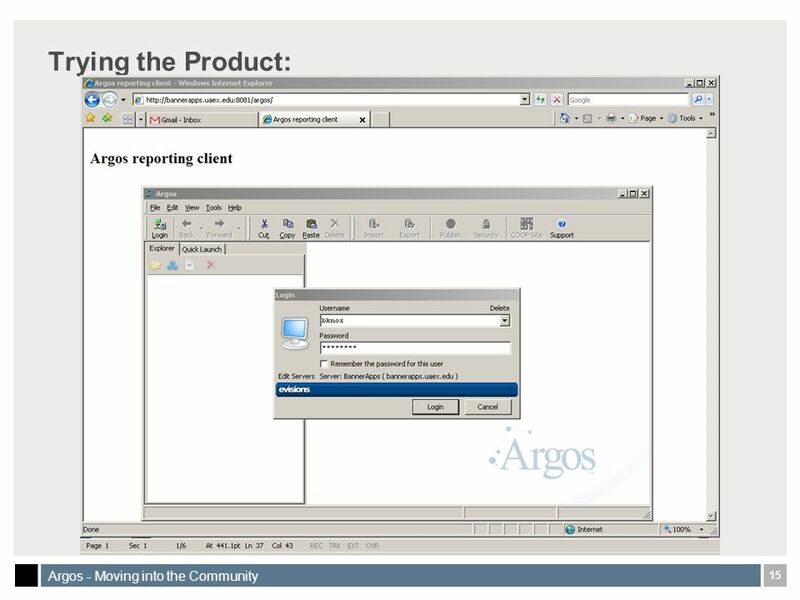 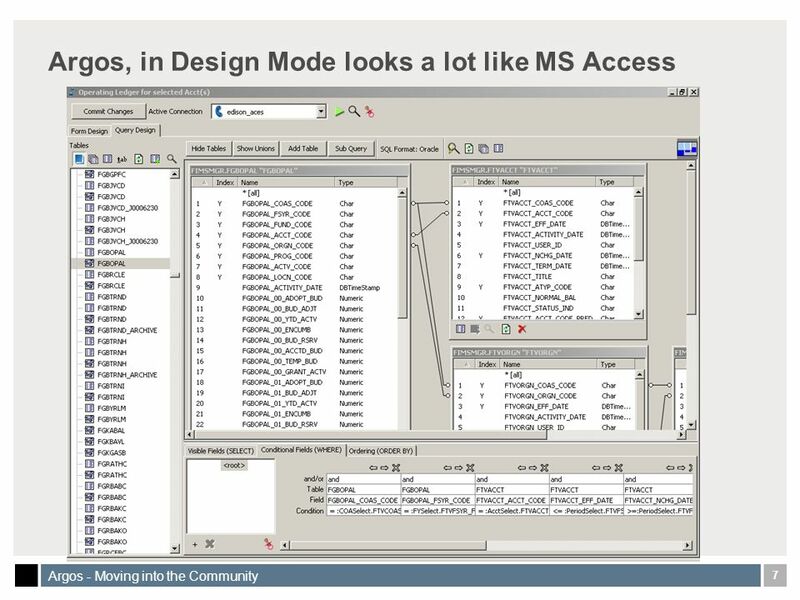 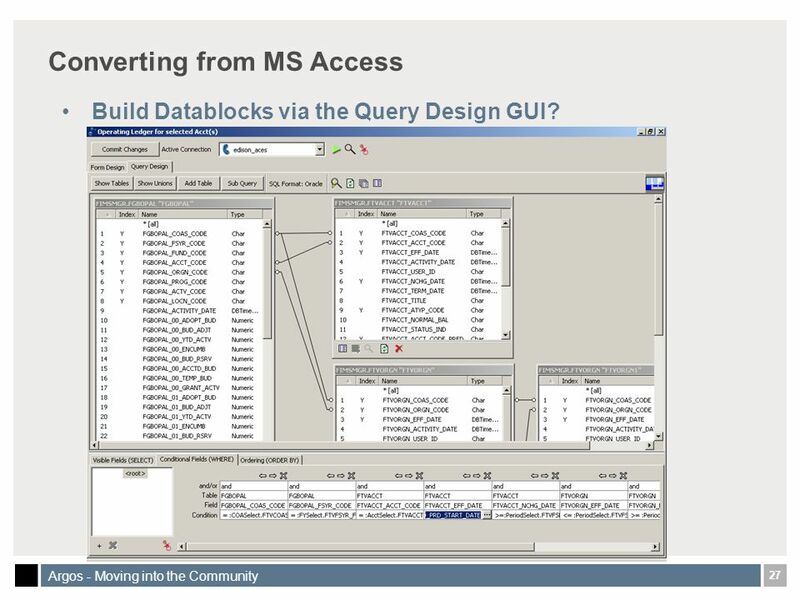 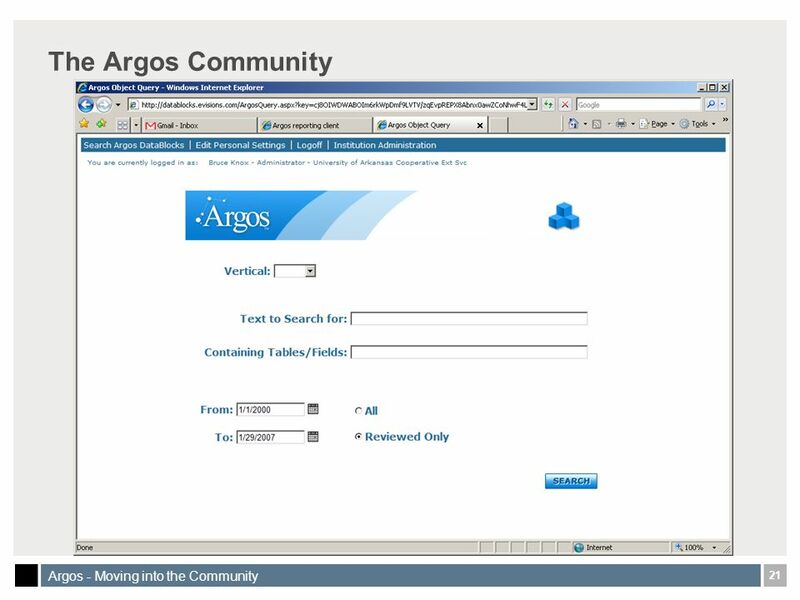 27 27 Argos - Moving into the Community Converting from MS Access Build Datablocks via the Query Design GUI? 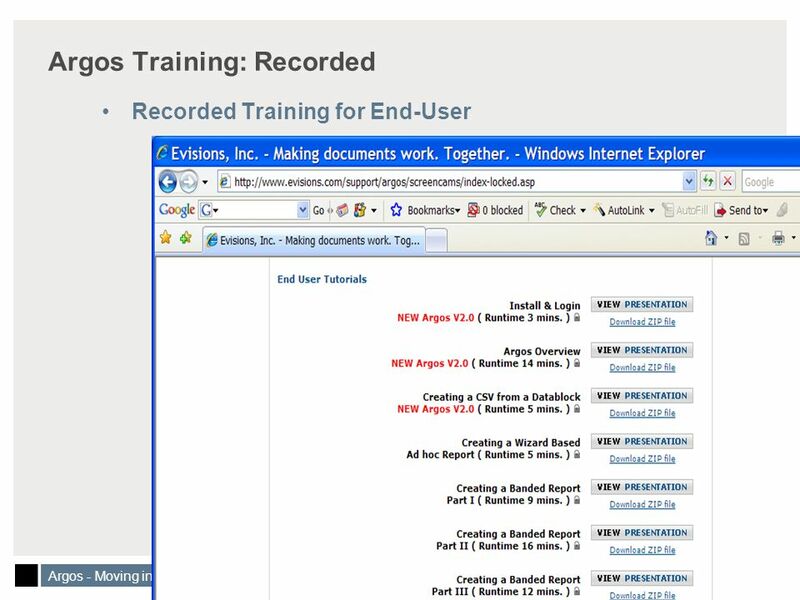 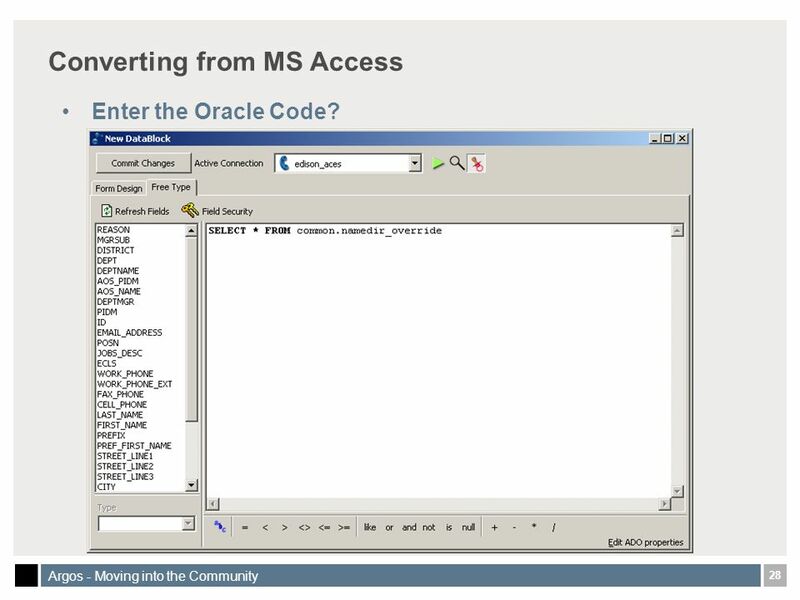 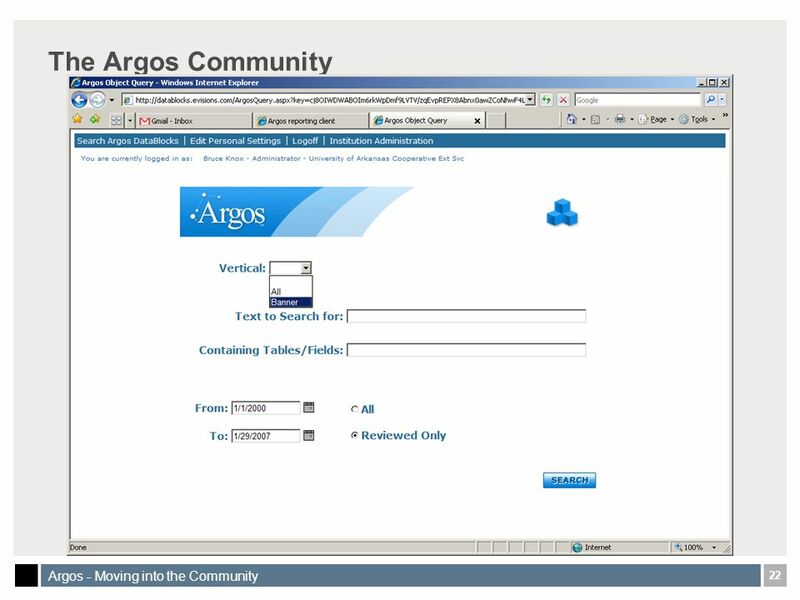 28 28 Argos - Moving into the Community Converting from MS Access Enter the Oracle Code? 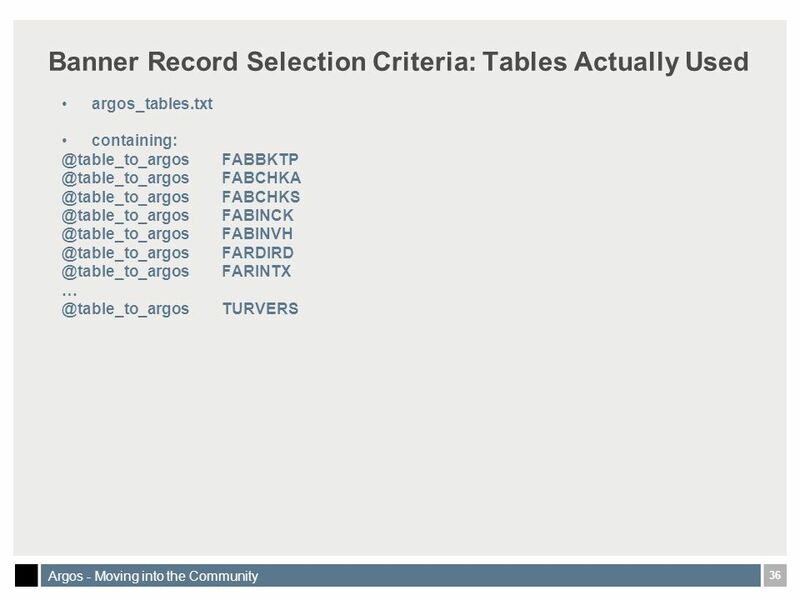 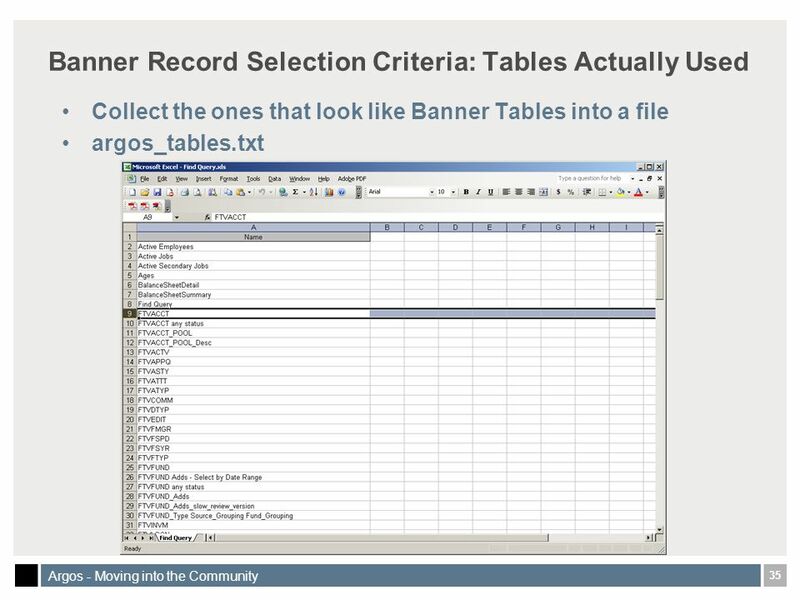 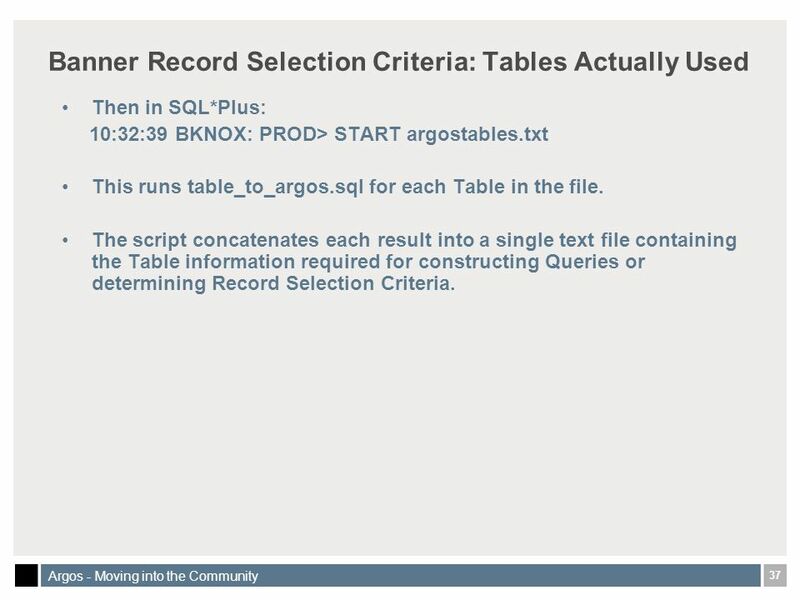 37 37 Argos - Moving into the Community Banner Record Selection Criteria: Tables Actually Used Then in SQL*Plus: 10:32:39 BKNOX: PROD> START argostables.txt This runs table_to_argos.sql for each Table in the file. 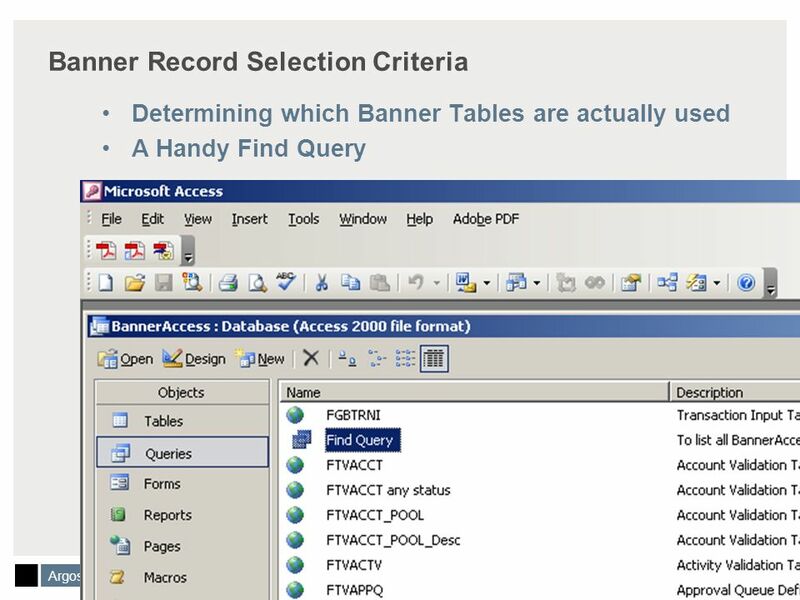 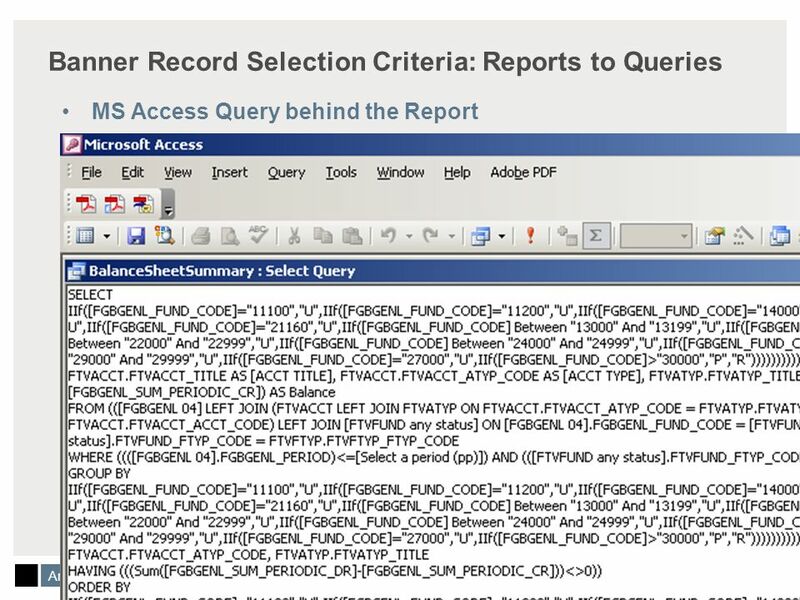 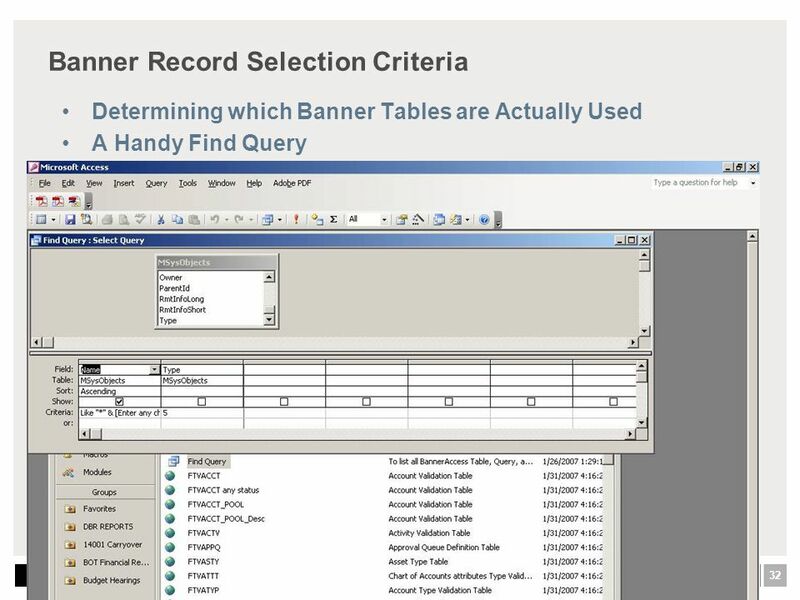 The script concatenates each result into a single text file containing the Table information required for constructing Queries or determining Record Selection Criteria. 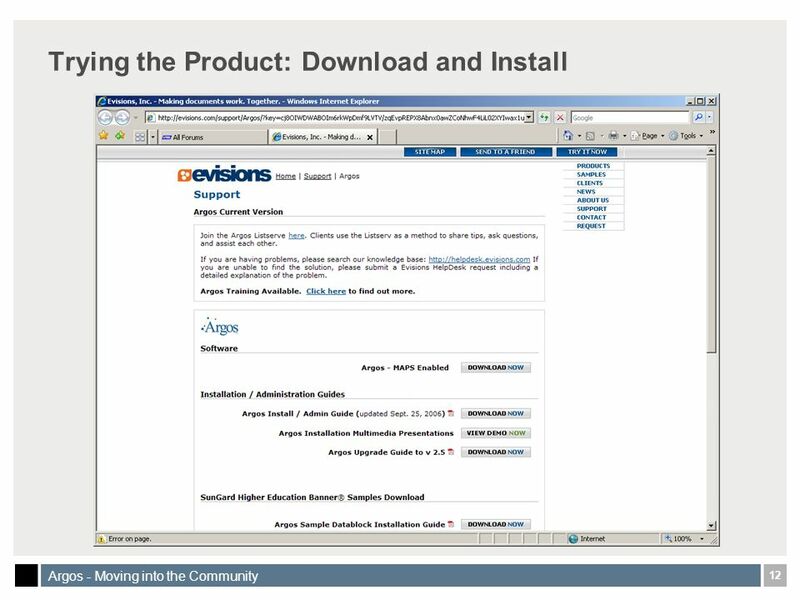 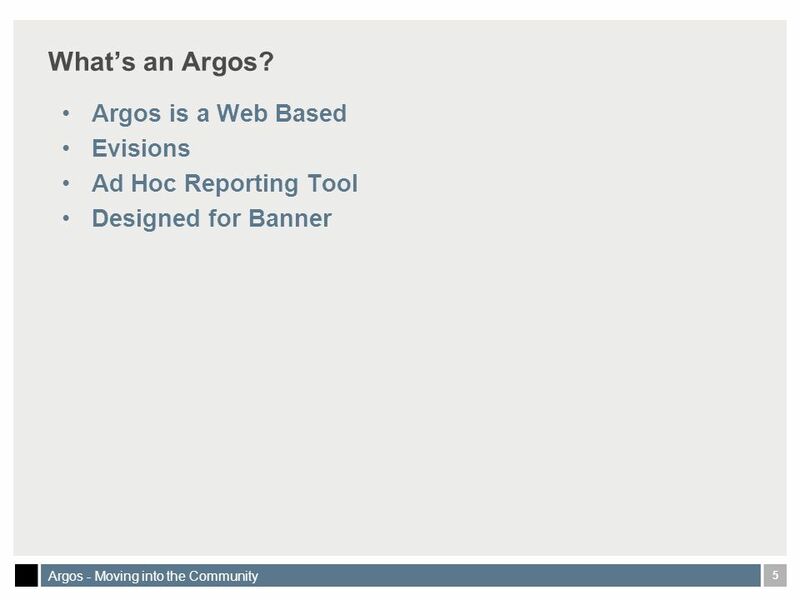 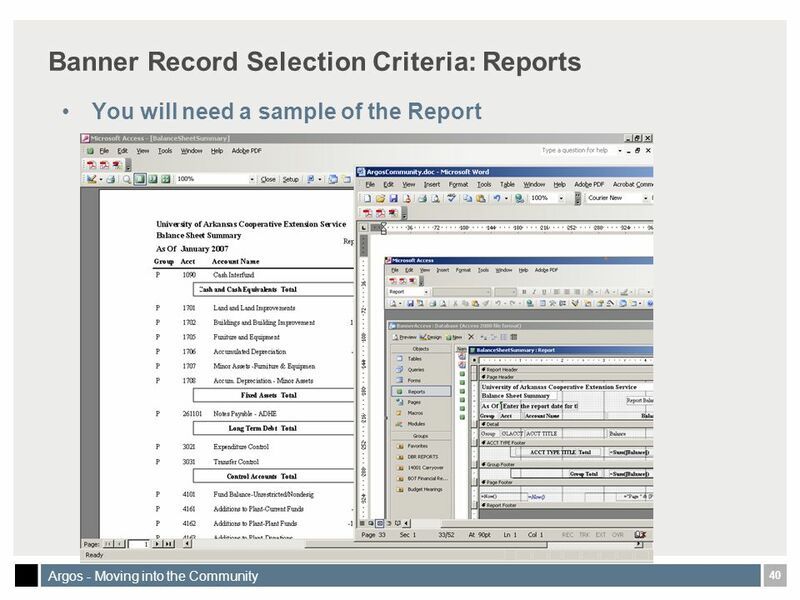 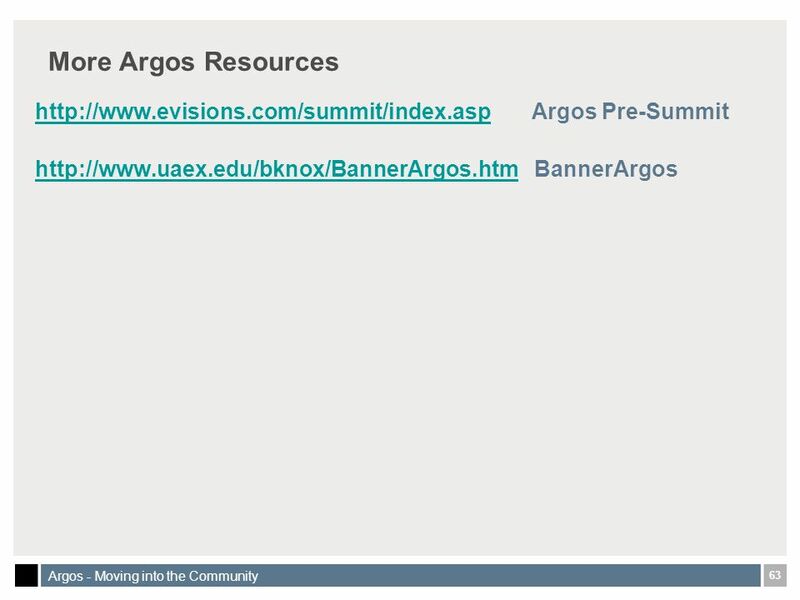 41 41 Argos - Moving into the Community Banner Record Selection Criteria: Reports to Queries Double-Click the Report Selector The Dark Square within the Gray Square left of the Ruler Line. 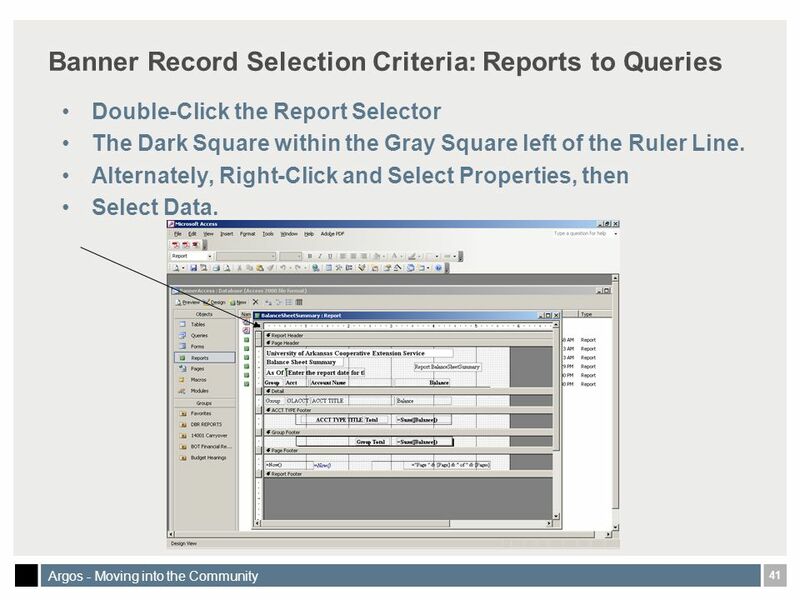 Alternately, Right-Click and Select Properties, then Select Data. 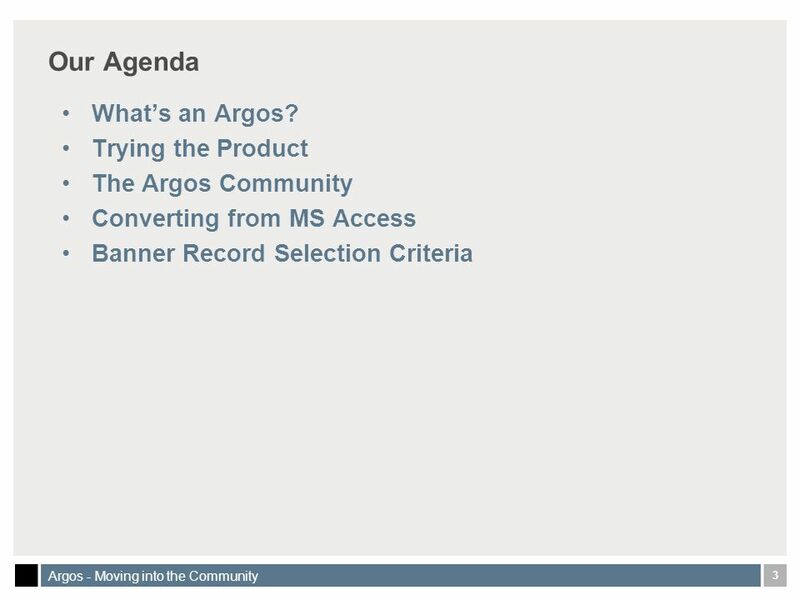 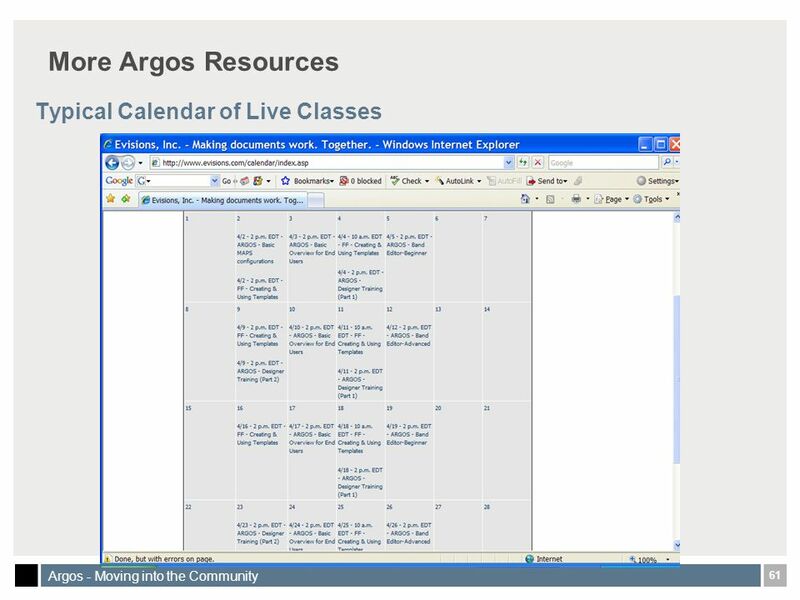 52 52 Argos - Moving into the Community Banner Record Selection Criteria: Reports to Queries And it works! 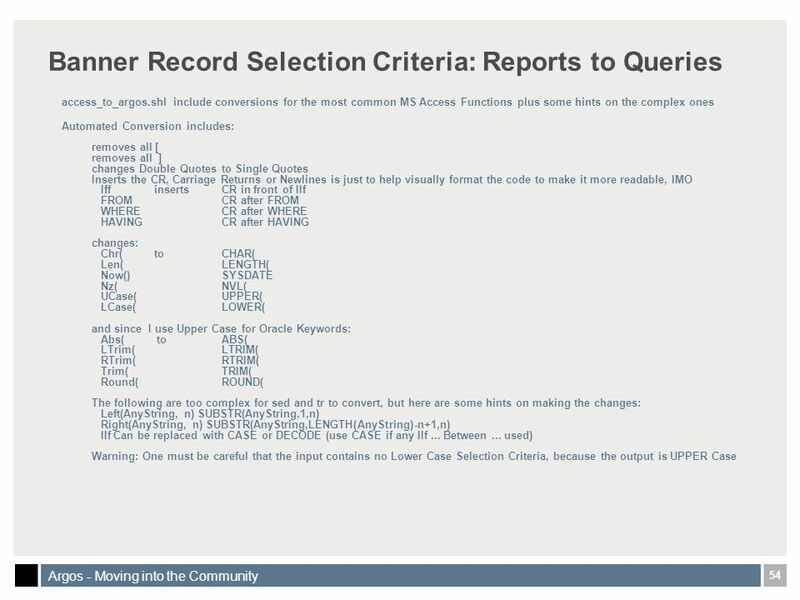 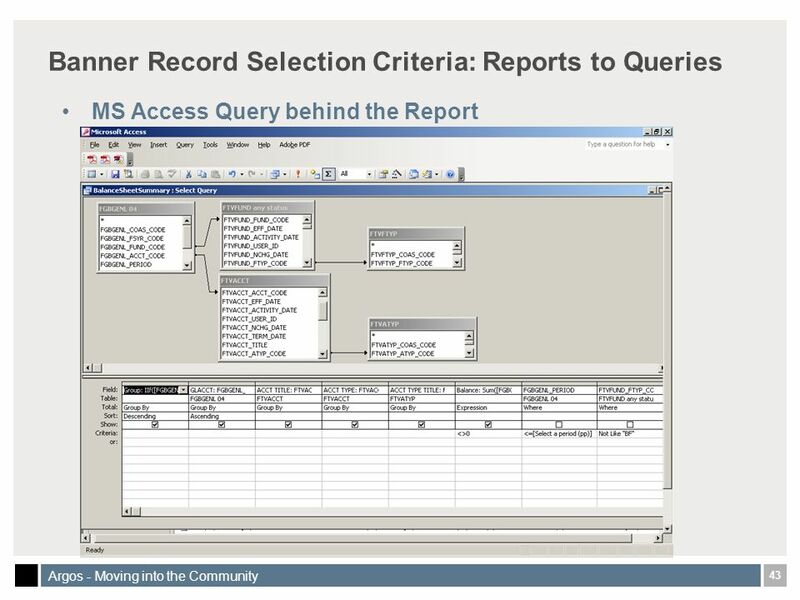 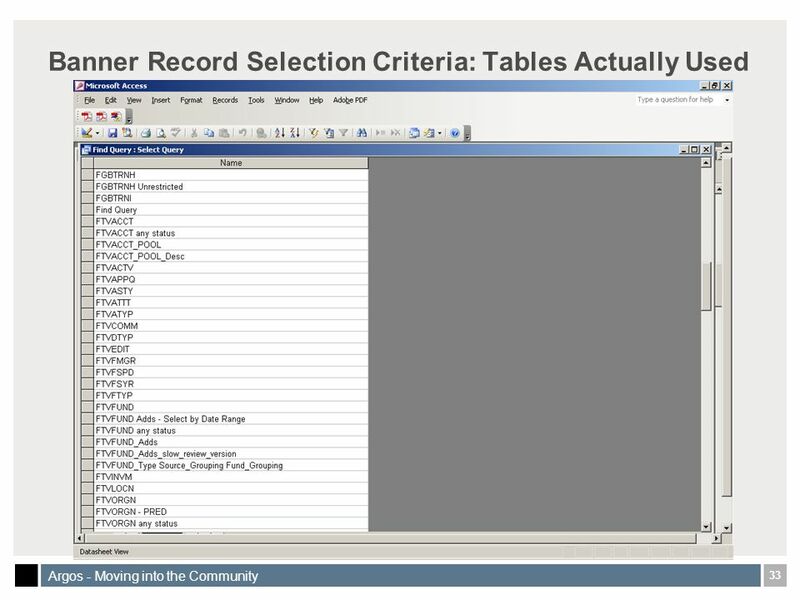 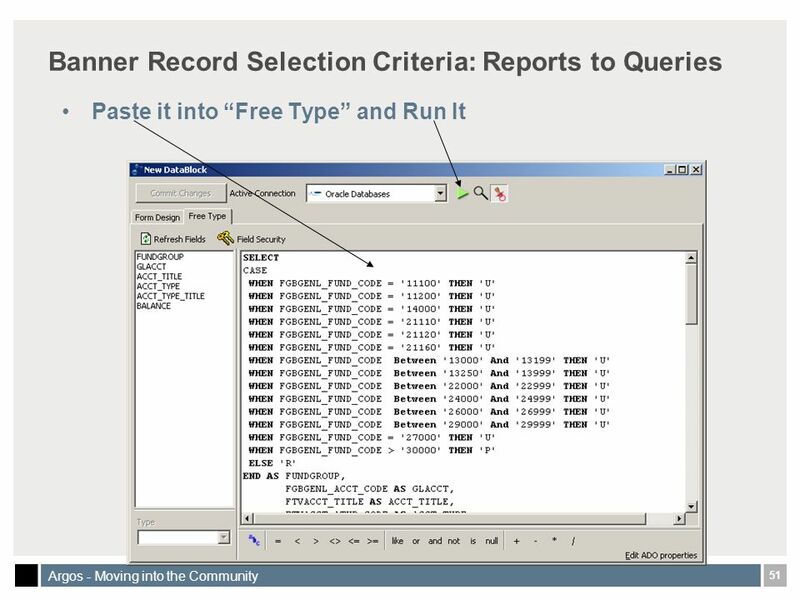 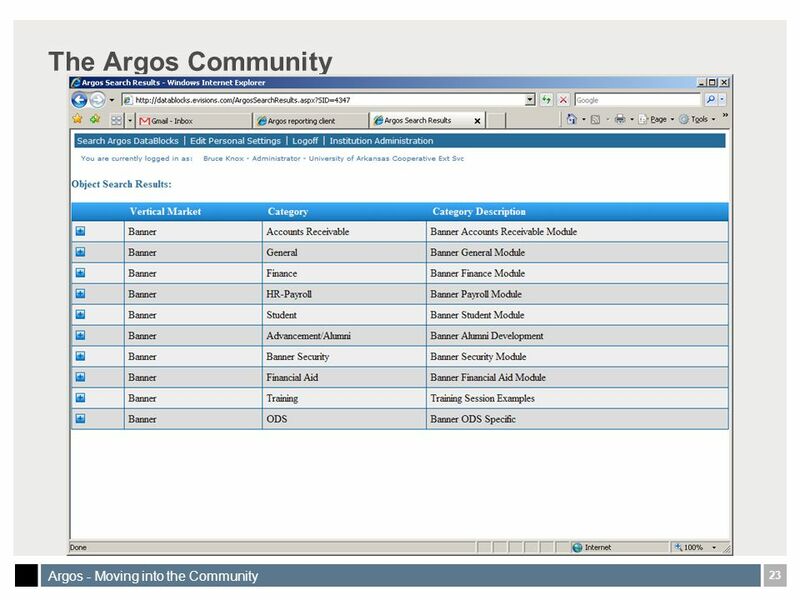 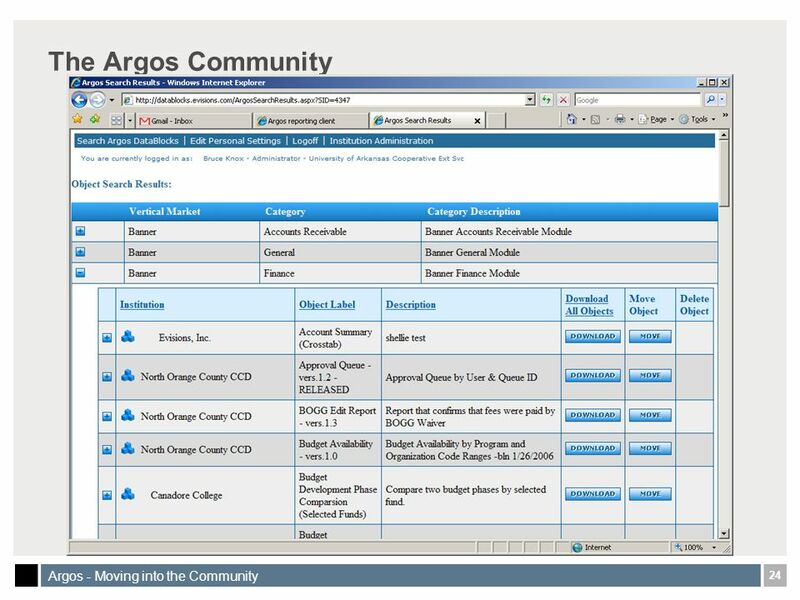 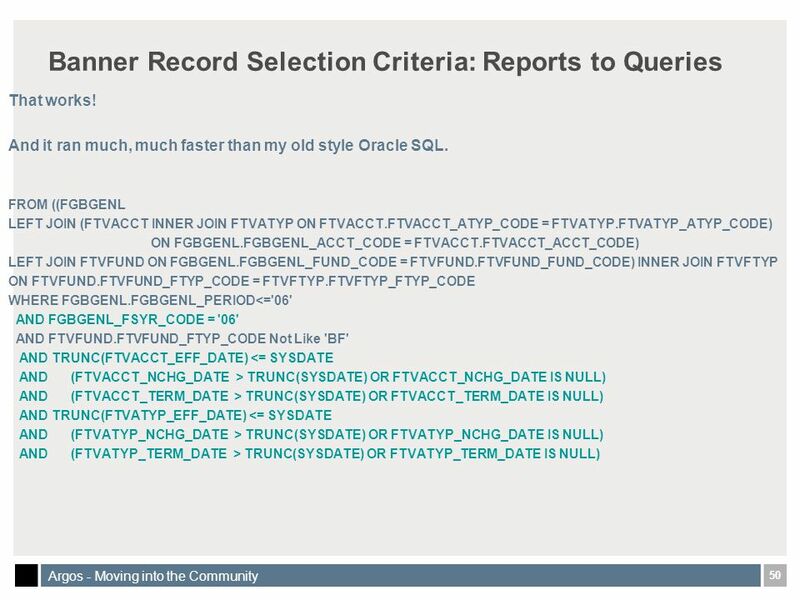 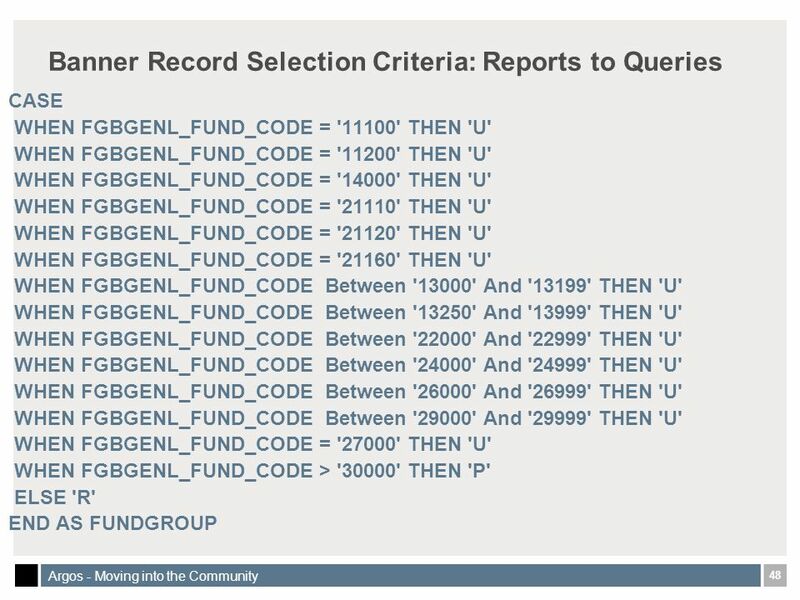 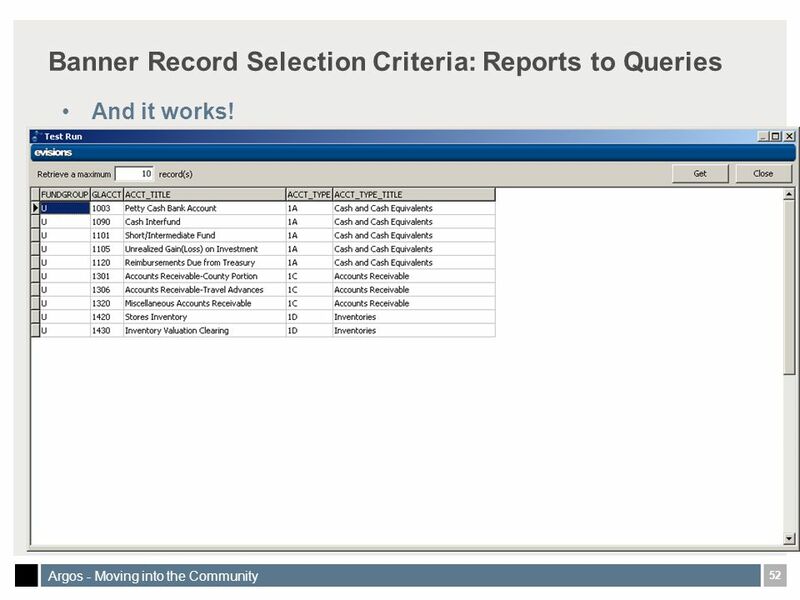 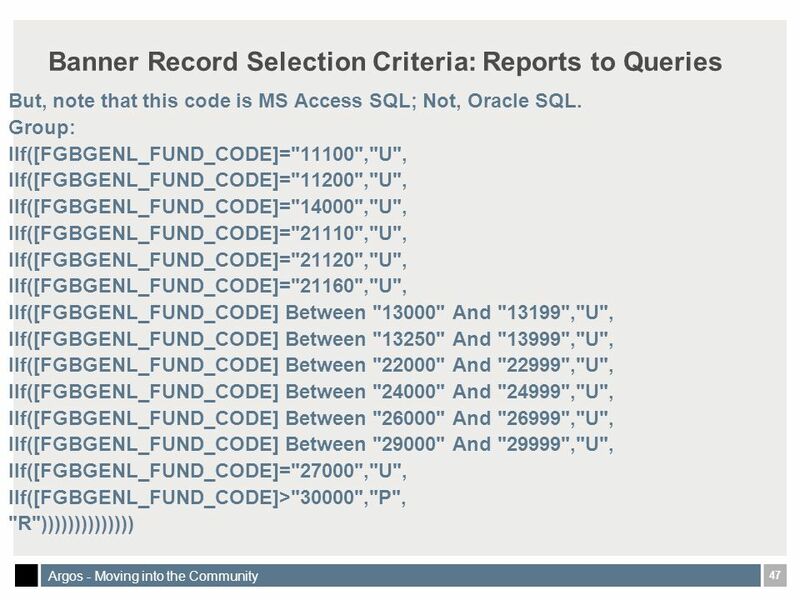 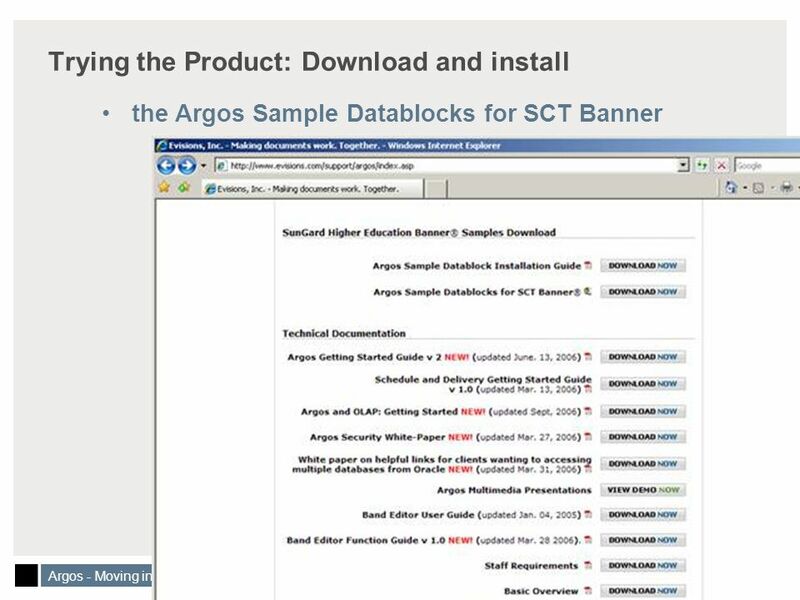 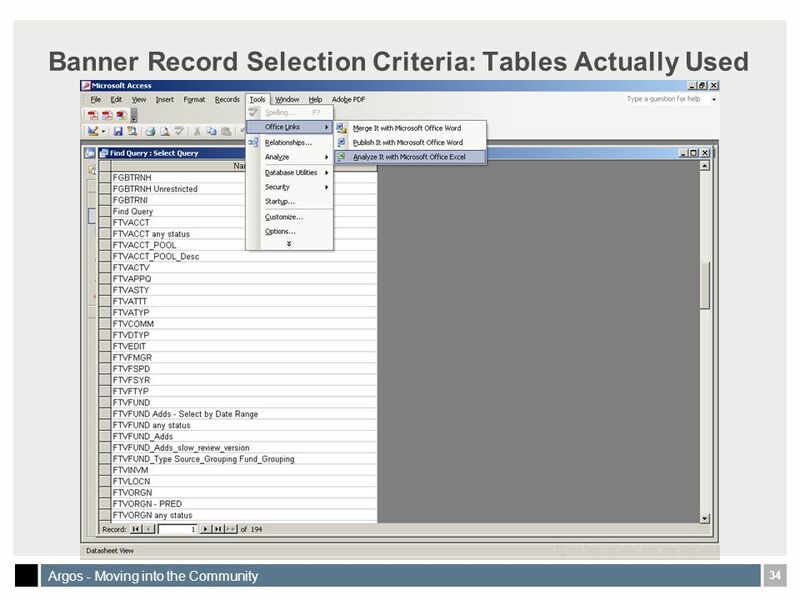 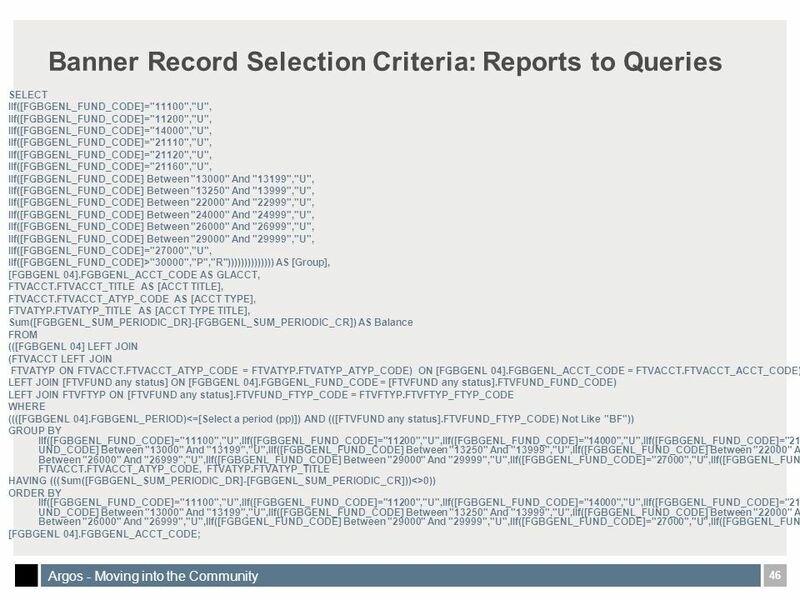 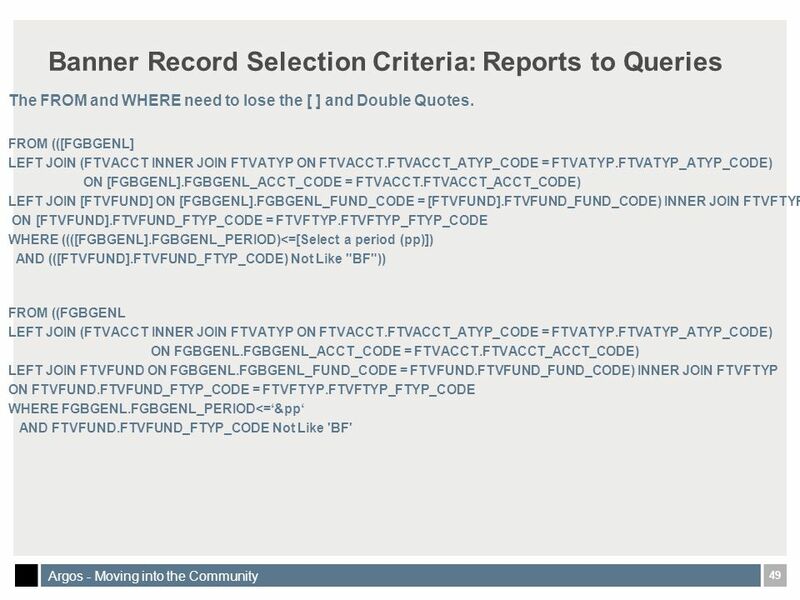 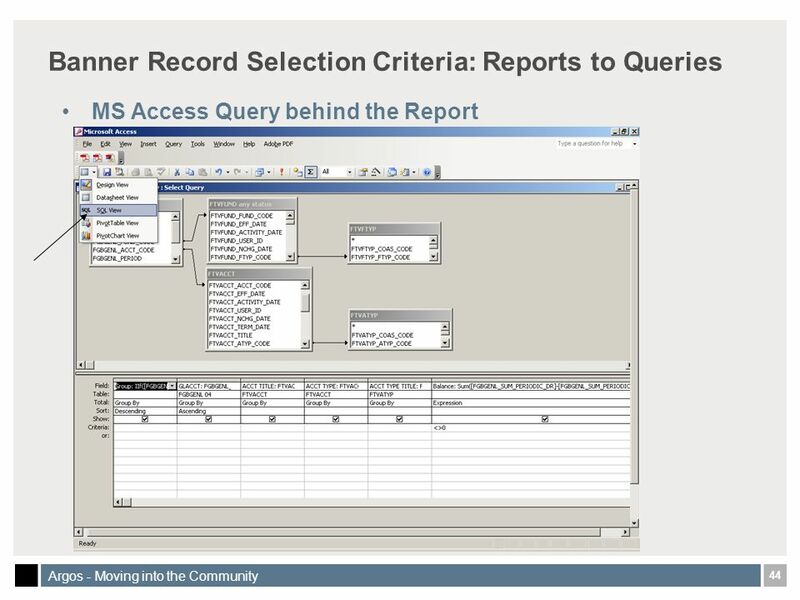 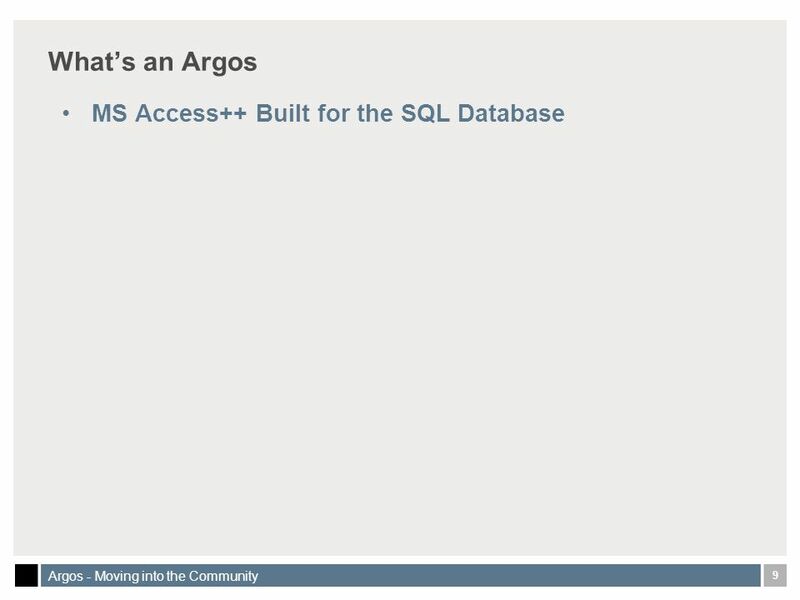 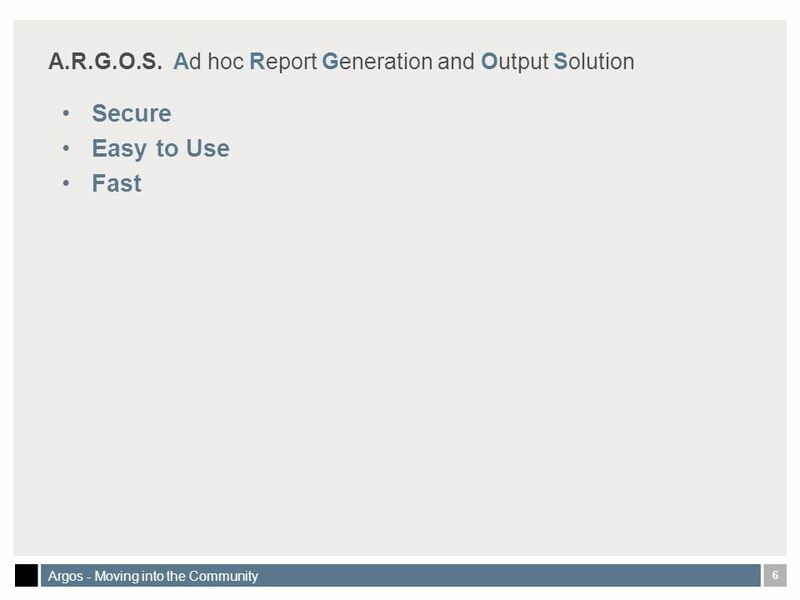 55 55 Argos - Moving into the Community Banner Record Selection Criteria: Reports to Queries You can build the Query using the COLUMNs, Tables, WHERE, GROUP BY, ORDER BY, and HAVING Or, Build the Query from your code. 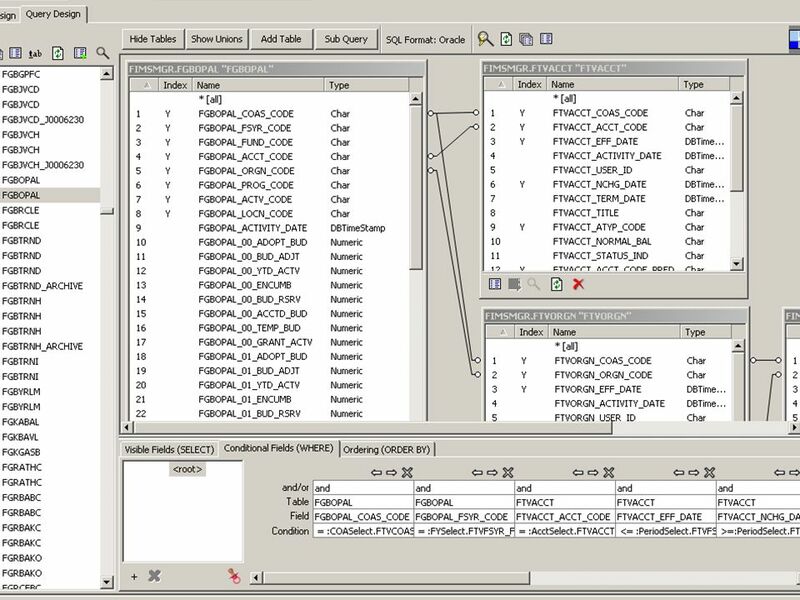 Either will allow you to use parameters. 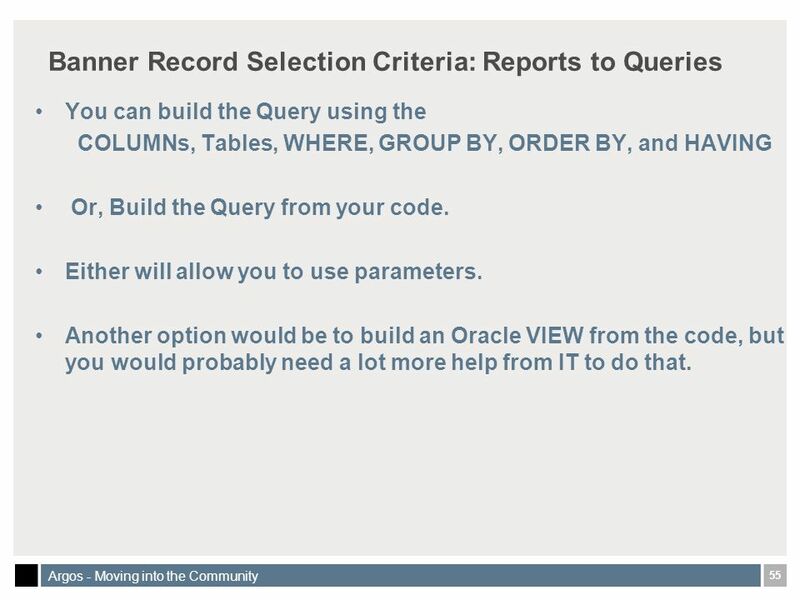 Another option would be to build an Oracle VIEW from the code, but you would probably need a lot more help from IT to do that. 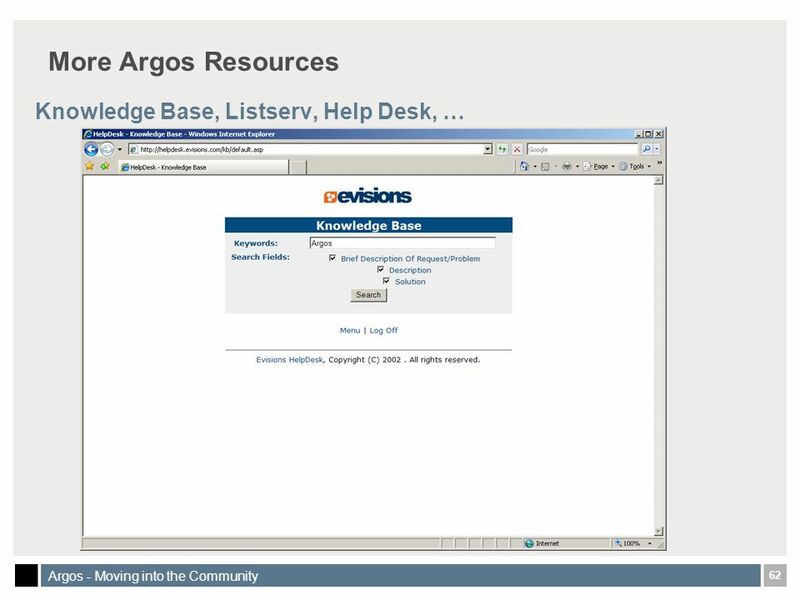 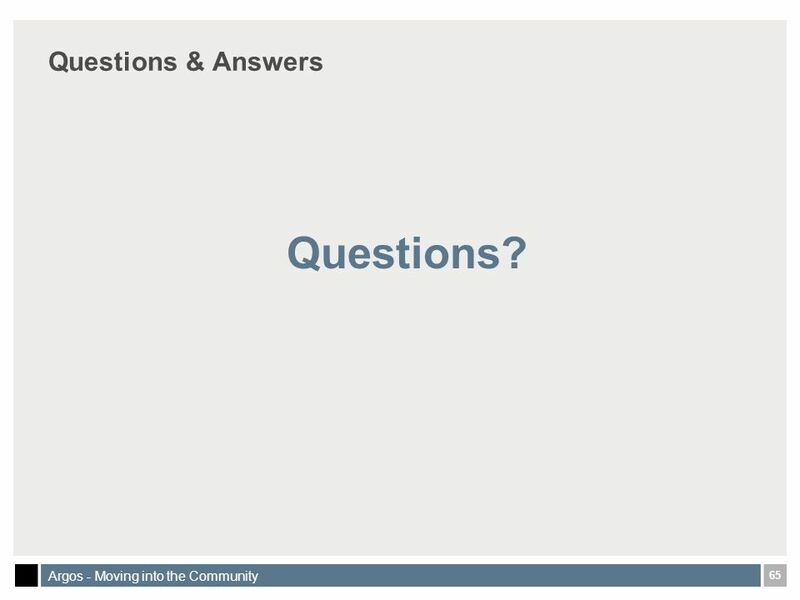 65 65 Argos - Moving into the Community Questions & Answers Questions? 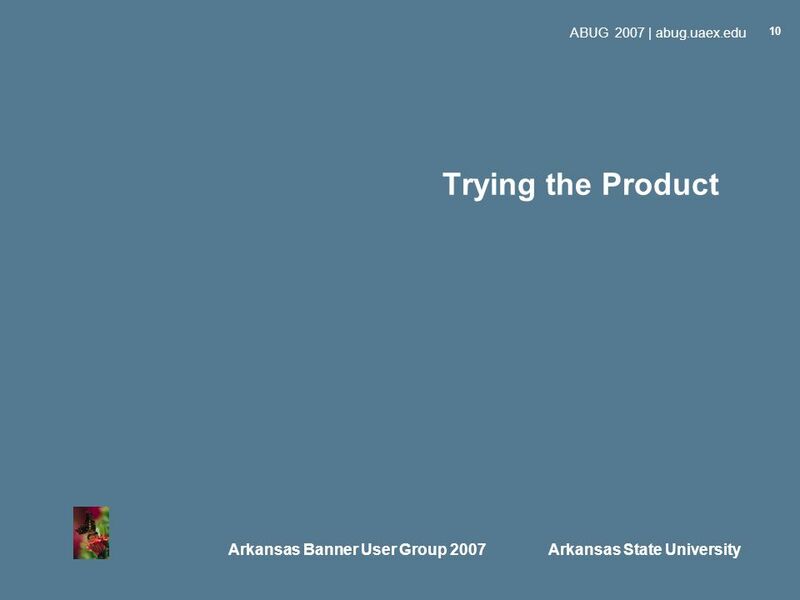 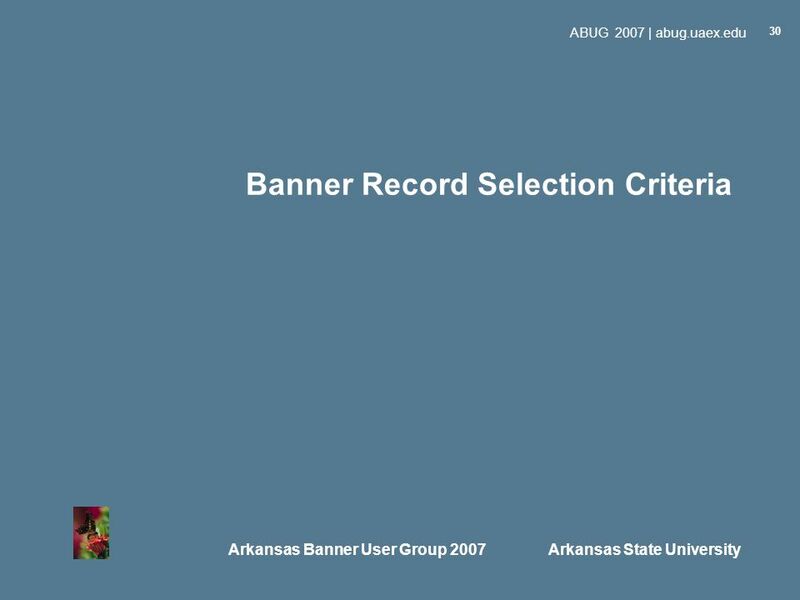 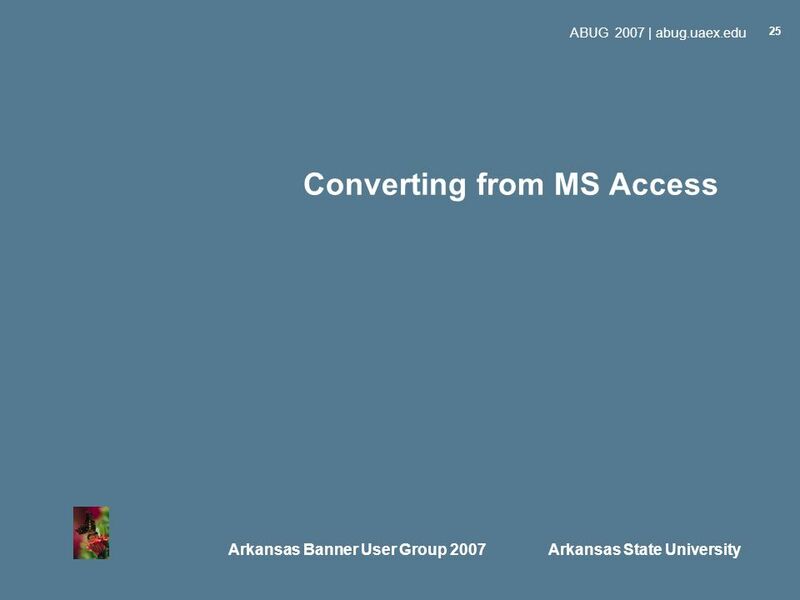 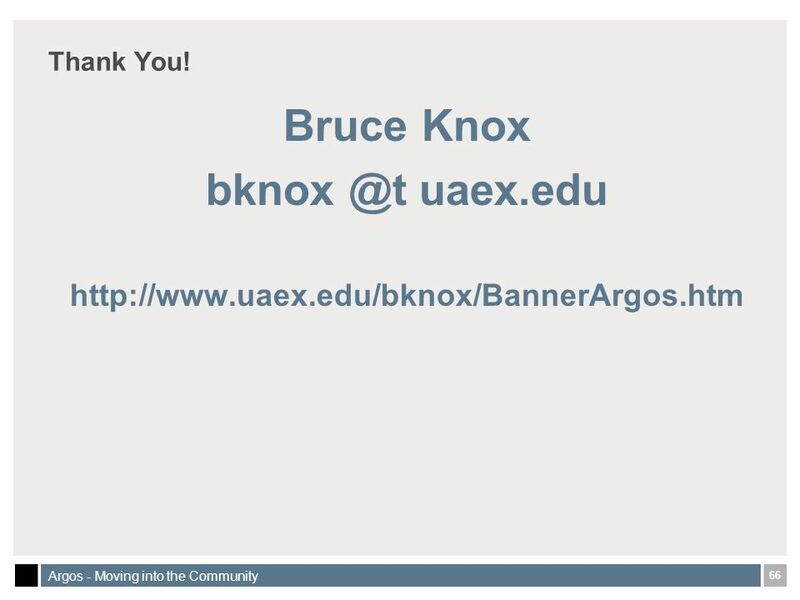 Download ppt "Arkansas Banner User Group 2007 Arkansas State University ABUG 2007 | abug.uaex.edu 1 Argos - Moving into the Community Presented by: Bruce Knox University." 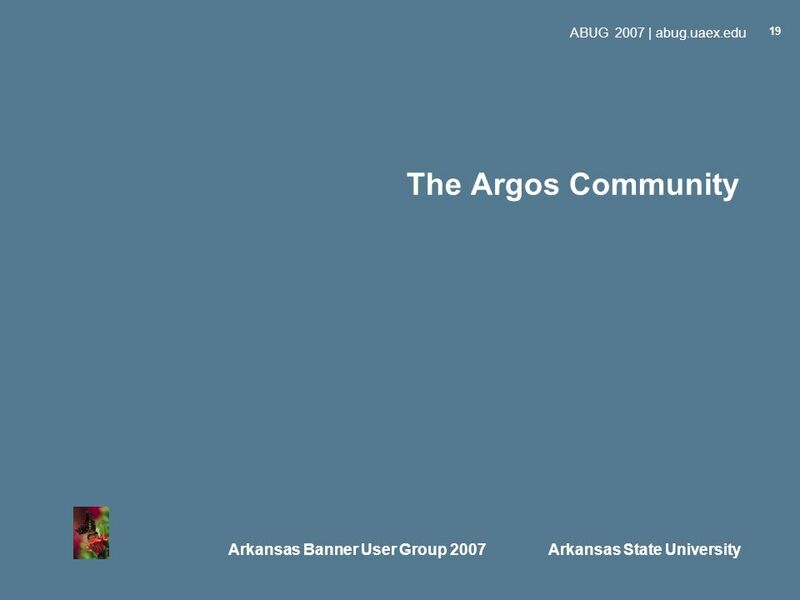 Tennessee Summit 2008 Murfreesboro Tennessee Summit on Administrative Computing Technologies (ACT) 1 Argos - Moving into the Community Presented by: Bruce. 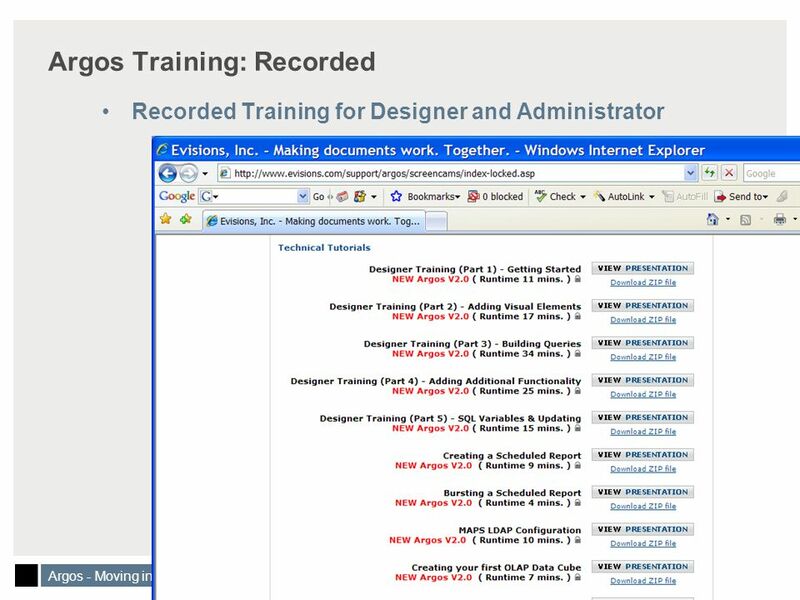 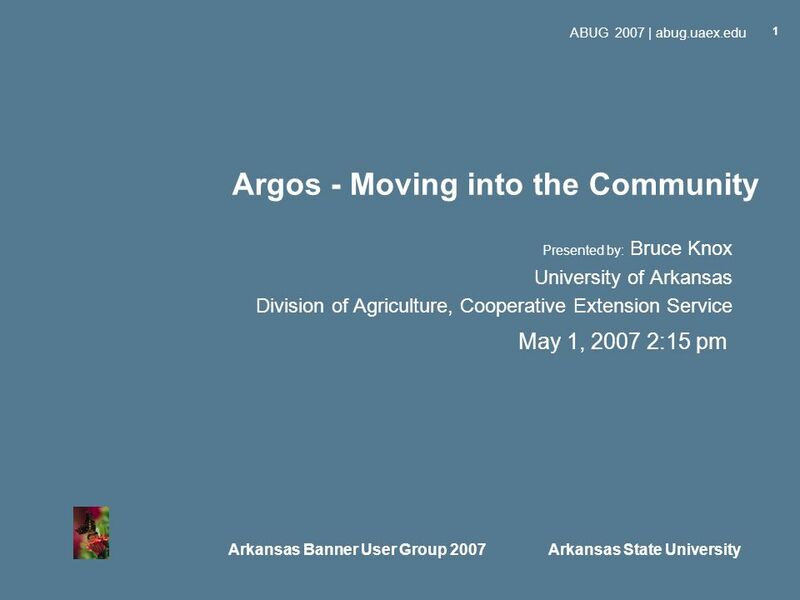 University of Arkansas Division of Agriculture Cooperative Extension Service Argos - Moving Quickly into the Community Presenter: Bruce.